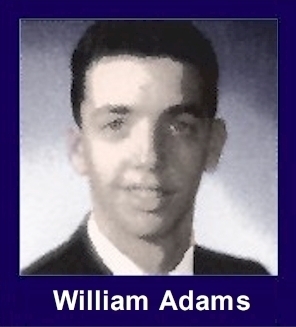 The 35th Infantry Regiment Association salutes our fallen brother, PFC William James Adams, who died in the service of his country on May 18th, 1969 in Kontum Province, Vietnam. The cause of death was listed as Small Arms/AW. At the time of his death William was 21 years of age. He was from Iowa City, Iowa. William is honored on the Vietnam Veterans Memorial at Panel 24W, Line 35. The decorations earned by PFC William James Adams include: the Combat Infantryman Badge, the Bronze Star, the Purple Heart, the National Defense Service Medal, the Vietnam Service Medal, the Vietnam Campaign Medal and the Vietnam Cross of Gallantry with Palm Unit Citation. Services for Pfc. William J Adams, 21, of 5 Ashwood Drive, who was killed in Vietnam May 18, will be at 2:00 p.m. Tuesday at the Donahue Mortuary with the Reverend Eugene H Hancock officiating. Burial will be Thursday in the Boaz Chapel Cemetery at Fulton, KY. Friends may contribute to a memorial at the Hospital School for Handicapped Children. Pfc. Adams was born July 14, 1947 at Cincinnati, Ohio to Mr. and Mrs. Arthur L Adams Sr. He came to Iowa City in 1956, and graduated from Iowa City High School in 1965 where he was a member of the National Honor Society. He attended Iowa State University for two years and entered the Army in July 1968. Surviving are his parents; three brothers, Arthur of Salisbury, MD, John of Tampa, FL, and twin Robert at home.